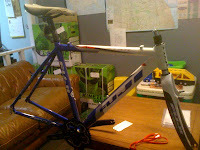 This is a Fuji Cross Comp Frameset 52cm, It was only test ridden, it's parts were removed for another build.it is Aluminum, with a Carbon Fork, Canecreek Headset, FSA Gossomer Crankset, Fuji Seat and Post. as a complete bike its MSRP was $1270. we are selling it for $450. Give a call if you have any questions.